Huang Gongwang was exceptionally gifted as a youth, mastering the Chinese classics at an early age. He also studied Daoism and later became a follower of the Quanzhen Sect (全真教). Traveling throughout the Songjiang and Hangzhou regions, he made a living by fortune-telling. Like his interest in calligraphy and music, painting was an activity practiced on the side. 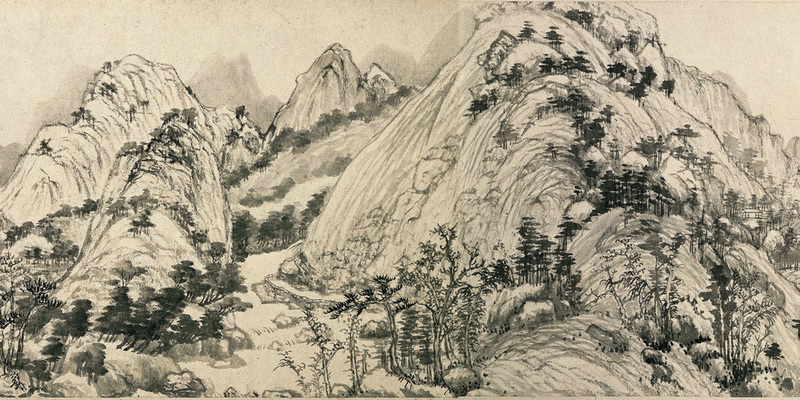 His landscape paintings are based on the manners of Dong Yuan (董源) and Juran (巨然), 10th-century artists who depicted the soft rolling landscape of the south. Along with Wu Zhen (吳鎮, 1280–1354), Ni Zan (倪瓚, 1301–1374), and Wang Meng (王蒙, 1308–1385), Huang Gongwang is considered one of the Four Great Masters of the Yuan and revered as their spiritual leader. Huang Gongwang worked on the painting “Dwelling in the Fuchun Mountains” on and off when the mood struck him from about 1347 to 1350, when the major portions of this handscroll were completed. 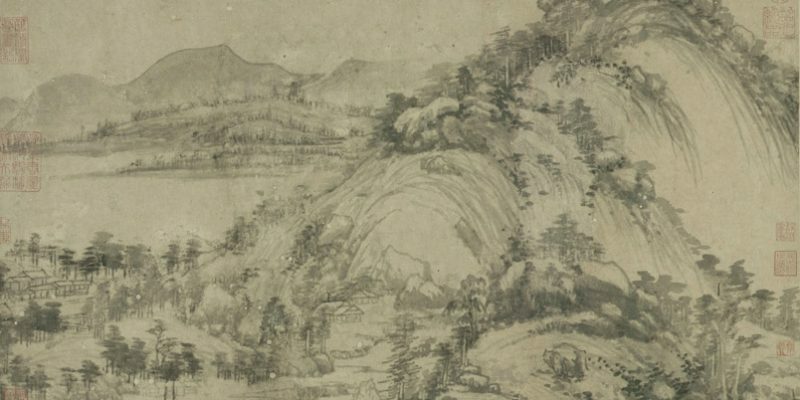 This representation of the Fuchun Mountains was painted for a fellow Daoist named Master Wuyong (無用師) and represents Huang’s greatest surviving masterpiece, which is now in the National Palace Museum in Taipei. Depicted in this handscroll is an idealized panorama of the Fuchun Mountains, west of Hangzhou, to which Huang returned in his later years. 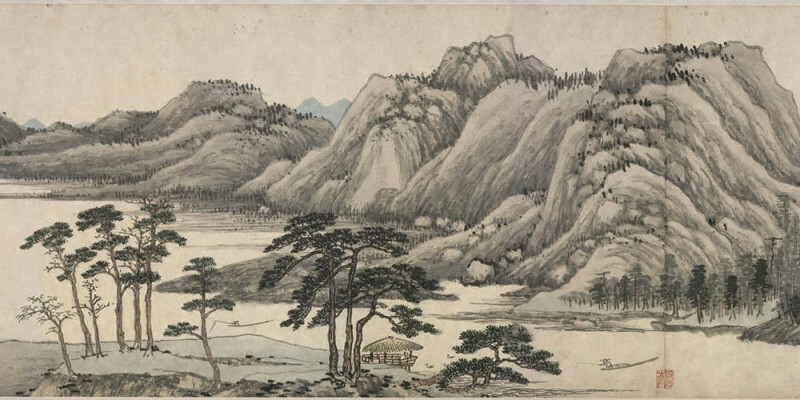 Beginning with a vast expanse of river scenery at the right, the painting moves on to the mountains and hills, then back to areas of river and marsh that end with a conical peak. Finally the landscape ebbs out in the distant ink-wash hills over the water. The composition was first laid out in light ink and then finished with successive applications of darker and drier brushwork. Sometimes shapes were slightly altered, contours strengthened, and texture strokes or tree groups added here and there. In addition, brush dots were distributed across the work as abstracted accents. Buildings, tree limbs and foliage are reduced to the simplest of forms as Nature has been translated into the artist’s terms of brush and ink. Huang Gongwang began working on the painting around 1347 and took about three to four years to complete it. He presented it to Master Wuyong as a gift in 1350. A century later, the painting was acquired by the Ming Dynasty painter Shen Zhou (沈周, 1427–1509). During the Chenghua Reign (1464–1487), Shen Zhou sent the painting to someone for inscription. However, the son of this calligrapher seized the painting which, after a few changes of hands, reemerged on the market at a much higher price. Unable to afford the price, there was nothing Shen Zhou could do except to make a copy of the painting himself based on his memory. This imitation by Shen Zhou is also well acclaimed and now in the Palace Museum in Beijing. Not long after he made the copy, Shen Zhou gave it to a friend named Fan Shunju (樊舜舉). Fan Shunju then began to search for the authentic copy. When he found it, he bought it at a hefty price and invited Shen Zhou to inscribe on it. Shen Zhou then noted down at the end of the scroll the story of how the painting was lost and found. Over the following centuries, the painting had come to know several owners, including Tan Zhiyi (談志伊), Dong Qichang (董其昌), and Wu Zhengzhi (吳正志). When Wu Zhengzhi died, he passed the painting to his third son Wu Hongyu (吳洪裕), who loved the painting so much that when he went on refuge during the invasion of the Manchu, he left behind all valuables and only brought the painting and a copy of the Thousand Character Classic (千字文) by Master Zhiyong (智永法師). In fact, he was so fond of these two pieces of work that he had them burnt shortly before he died, so that he could bring them to the netherworld. Fortunately, Wu Hongyu’s nephew Wu Jing’an (吳靜庵) rescued the painting, which was however already aflame and torn into two. The first and smaller piece, measuring slightly more than half a meter, was subsequently renamed The Remaining Mountain (剩山圖). After passing through the hands of numerous collectors, it came to the possession of Wu Hufan (吳湖帆), painter and collector, during the Second Sino-Japanese War. It finally settled down today in Zhejiang Provincial Museum in Hangzhou. The journey of the second and longer piece (i.e. the Master Wuyong Scroll) was perhaps more dramatic. It passed through the hands of several high-level Qing dynasty officials, including Gao Shiqi (高士奇) and Wang Hongxu (王鴻緒), before landing in the Imperial Palace. Ironically, the Qianlong emperor, who prided himself in his connoisseurship, judged that this new acquirement was a counterfeit and insisted that a piece of imitation he already possessed was authentic. This mistake was only corrected in 1816, during the reign of the Jiaqing emperor. This piece was eventually brought to Taiwan after the Kuomintang lost the civil war and is now kept in the National Palace Museum in Taipei. From June to September 2011, the two parts of the original handscroll, i.e. the Master Wuyong Scroll and the Remaining Mountain, were put on a joint exhibition for the first time at the National Palace Museum in Taipei.